Lisa Buyer takes three with the launch of Social PR Secrets 3rd edition. Public relations, digital marketing and social media marketing pros won;t want to miss this. Even if you read the first and second versions, the 3rd edition is a complete refresh with an additional 9 more chapters. Social PR Secrets Third Edition is almost double the size of the second edition with completely refreshed content, more than 75 actionable Social PR Secrets (tips), and hundreds of resources all in one place to take your brand to Social PR power user status. If PR people don't embrace social media, they will be left in the dust. The concept of sucking up to a few major publications and offering exclusives to the one that promises the most coverage is a risky concept. For one thing, the major publications no longer "make"products and services; they often report on products and services that have been made. Trickle down is waning. Bubble up is the new game. Or should they be? It's a brave new world and Social PR Secrets lights the match where most burn out. PR and ad agencies, digital marketers, business owners, and professors at the University of Florida and Brigham Young University are turning to Social PR Secrets as required reading. 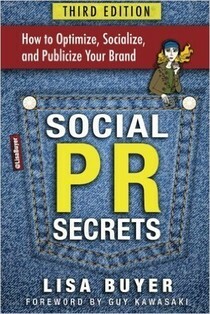 Order Social PR Secrets today. what was your first computer? this was mine. Senior Lacrosse night at Celebration High School. Love my #3 so much!! Making Daddy so proud!!! Love our modern family. Love how we have bonded after such a tragic loss. I love us!! !